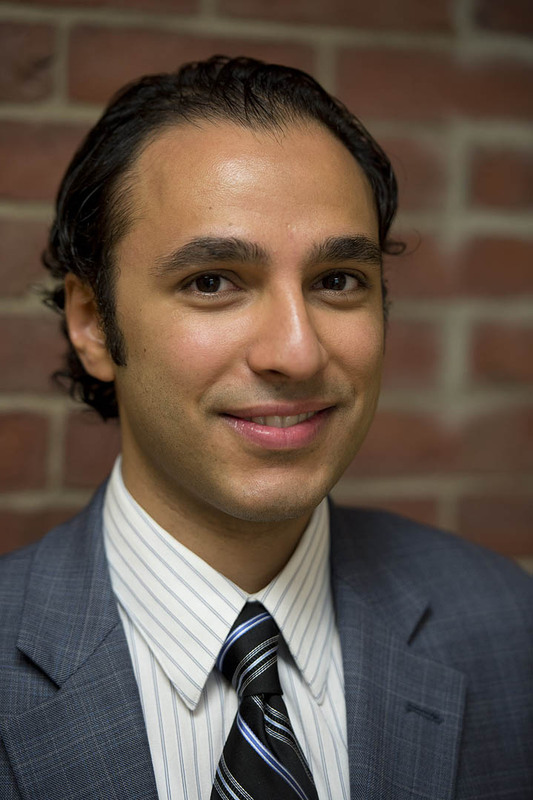 Ali Akhtar, assistant professor of religious studies and of classical and medieval studies, has organized a lecture series on encounters between Europe and the Islamic world and offers a talk in the series March 25. Photograph by Michael Bradley/Bates College. With a talk called Coming to Terms With Islamic Spain: Contemporary Stagings in Modern Spanish Theater, an expert in Spanish theater from Bard College opens a lecture series exploring cultural encounters between Europe and the Islamic world at noon Monday, March 4, in the Muskie Archives, 70 Campus Ave.
David Rodriguez-Solas of Bard opens the series, titled Europe and the Islamic World: Cultural Encounters in Theater, Art and Politics. The series is open to the public at no cost. For more information, please contact Ali H. Akhtar at aakhtar@bates.edu or Jeanne Beliveau at jbelive2@bates.edu. Michelle Campos, an associate professor of modern Middle Eastern history at the University of Florida, gives the lecture Between Empire and Nation: Muslims, Christians and Jews at the End of the Ottoman Empire at 4:30 p.m. Tuesday, April 2, in Pettengill G65. Rodriguez-Solas is a visiting assistant professor at Bard College who teaches Spanish and Latin American and Iberian studies. He is the author of Teatros nacionales republicanos: la Segunda Republica y el teatro clasico espanol, (2013, “Republic National Theaters: the Second Republic and Spanish Classical Theater”). Avcioglu specializes in Islamic art and architecture. Her publications focus on imperialism, art and travel, the Enlightenment and exoticism, 19th-century Orientalism in architecture, post-classical Istanbul and modern and contemporary mosques in Europe. Akhtar studies the complex interactions among political, religious and intellectual establishments in Europe and the Islamic world in medieval and early modern times. “Scholars can paint a picture of the medieval political and intellectual landscape throughout the Mediterranean region in a way that can help modern societies better understand their current affairs and trajectories,” Akhtar says. Campos has lived and conducted research in Israel and Palestine, Egypt, Turkey, Jordan and Lebanon. Her areas of interest include the late Ottoman Empire, the social history of historical Palestine, Muslim–non-Muslim relations, urban history and social networks. The series is sponsored by the Department of Religious Studies and the Program in Classical and Medieval Studies, with additional support from the following: the Office of the President; divisions of humanities, social sciences, interdisciplinary studies; departments of politics, art and visual culture (in conjunction with the Alison Lockwood Fund for art history), Spanish, theater and dance, French and Francophone studies, and anthropology; and the program in European studies (in conjunction with the department of German and Russian studies).